Motorists using Interstate 90 to cross the Cascades this spring and summer will notice that a unique, classic feature of the freeway east of Snoqualmie Pass is no longer around. After 64 years, the I-90 snowshed next to Keechelus Lake has been removed by a road crew this week. Construction starts this summer on two avalanche bridges that will replace the outdated snowshed. The bridges are part of the $551 million project to widen I-90 from Hyak to Keechelus Dam. 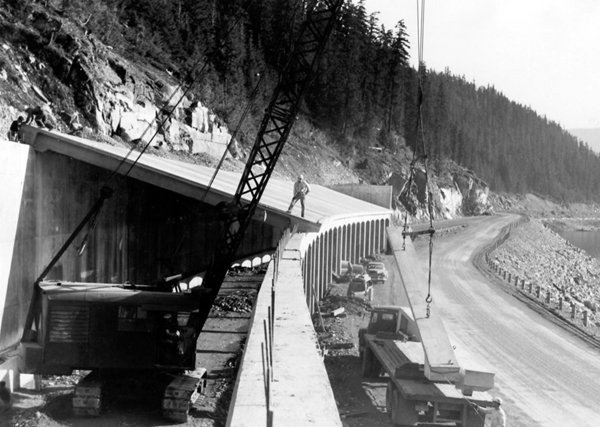 Our State Archives has several photos of the snowshed’s construction in 1950. Two of them, from Archives’ Washington State Department of Transportation collection, are featured here. Go here to learn facts and history about the snowshed, as well as the new bridges. 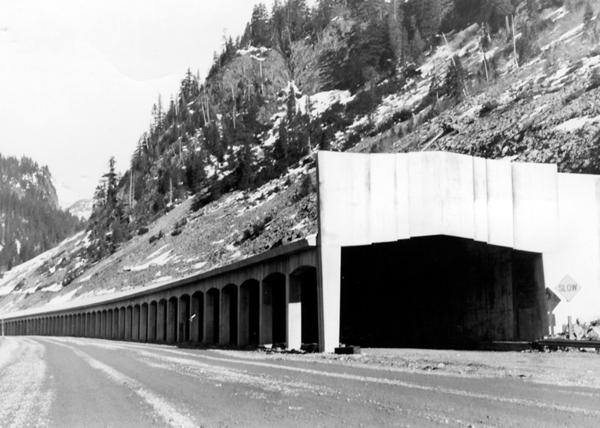 Built in 1950, the 500-foot concrete snowshed protected the freeway’s westbound lanes from avalanches. In fact, snowsheds have offered an important way for motorists to cross Snoqualmie Pass during the snowy season. In the early 1900s, a 419-foot wooden snowshed stood next to the lake to protect the highway from avalanches.